Officials at the Lighthouse Christian Academy in Bloomington, Indiana, say they've never turned anyone away based on sexual orientation. But at a congressional hearing, Senate Democrats cited Lighthouse as an example of a school that discriminates against LGBT students. They pointed to a school brochure that says the Bible does not allow homosexual, bisexual or "any form of sexual immorality." 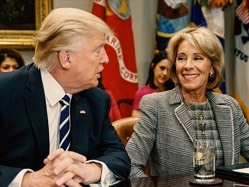 The Trump administration is seeking to expand "school choice," however, Education Secretary Betsy DeVos says it's not up to her department to intervene in this matter. Lighthouse defends its right to educate children according to its values, according to the Star Tribune, saying that Christians are state taxpayers, too and should be allowed to fund institutions of their choice with their money.